"Windows Phone 7 Connector is a simple, easy-to-use application designed to sync your favorite media files from your Mac, with your Windows Phone 7 or Zune HD. You can also sync photos and videos you captured on your phone with your Mac, and when needed, update your Windows Phone 7 software." 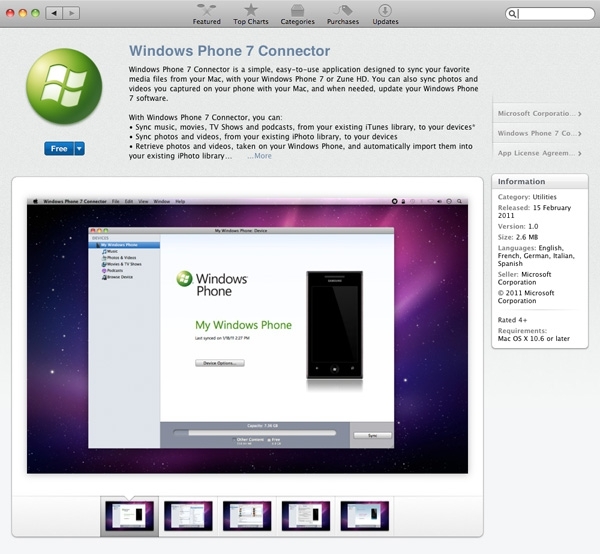 Microsoft has released v1.0 of Windows Phone 7 Connector to the masses, while exploring new territory by releasing it on the Mac App Store. It's a free app that lets you connect your Windows Phone 7 device or Zune HD to your Mac, sync your music, videos, and podcasts from iTunes and your photos to and from iPhoto, and even download and install the latest Windows Phone 7 updates as they're made available. Alas, there's no option to browse the Marketplace, but at least this is better than nothing, right? Scoot off to the App Store and grab it today.